Made 4/24/15 in Photoshop CS2. Using the lyrics from AFI's "Love Like Winter" as a springboard, it seemed appropriate to make a SyaoSaku wallpaper considering their whole "soul-mates through multiple dimensions" thing. And from Jade to Celes, there's certainly a wintry side to my TRC feels. 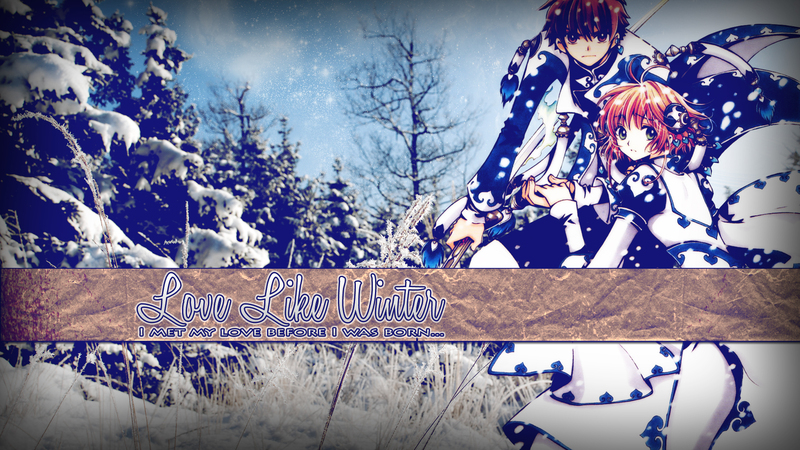 I worked off a snowy photograph from www.freeimages.com and tried to match the blue of Syaoran and Sakura's outfits. Added some sparkles for a nice, frosted, fresh snow look. Since the background is mostly relatively smooth, I contrasted that with a rougher, cardboard band behind the lyrics. Added a bit of blood-spatter to give something different to stand out against the cooler colors and to foreshadow all the tragedy in their story. I like this, the style is simple but as long as it looks great who cares :D. The trees look like toys <3 the mixed media doesn't look too odd to me really- the snow helps a lot. Its balanced. Is it just me or there is no signature?